6/17/2015; After four months of steady work on the project, today I ran out of kit tubing. In other words, the basic airframe is assembled. Below are some reflections on this first phase of the project--perhaps these may be useful for prospective builders. These are my opinions only and probably not held by all builders of Airdrome Aeroplanes kits. In scope the AA kit falls somewhere between a "complete" kit and a pure materials kit. A materials kit will have the raw stock needed but no machined, cut, or formed components. 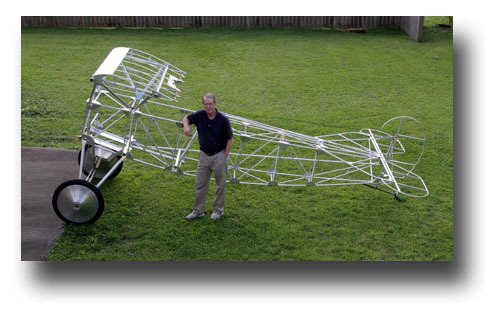 These are kits similar to what Aircraft Spruce offers for many classic and vintage experimental designs. At the other end of the spectrum are Vans RV kits. These are complete airframe kits with prepunched holes, machined and pre-formed components, and accurate hardware assortments. Obviously, the builder pays for the fabrication present in the full kits. I consider the D.VII kit to be a hybrid. I found all tubing necessary for the airframe to be included in the kit along with many precut gussets. Also included were wheels, fuel tank, cable stock, turnbuckles and other components. The tubing must be cut and bent as necessary but is labeled so it can be associated with the proper subkit. The kit is priced considerably above cost of materials but this is expected due to the fabrication involved. However, there are some weak areas of the kit experience which could be improved. One is the lack of a packing list which makes it nearly impossible to inventory the kit when it is received. I had some hardware shortages that didn't become apparent until I reached that point of construction. While AA was prompt (after some gentle reminders via phone) to make good on most of the shortages, it would have been much better to find them as the shipping crate was unpacked so they could be addressed promptly and all at the same time. Another weak area when compared to mainstream kits is documentation. A generic build manual is included along with many pages of basic dimensions but there are many areas of the airframe that are not covered in the plans or manual. Some of these areas receive attention via a photo CD and DVD of a build that occurred in the AA shop. But a first-time builder is going to be seeking guidance from someone who has prior experience with scratch-building aircraft. Even though Robert Baslee will discuss issues during a phone call, more specific documentation would be very helpful for all builders, especially those with limited shop experience. I recognize that technical writing is time consuming (expensive) and requires skill, but more extensive docs would take this kit to the next level. My kit had some damaged sheet stock due to the fuel tank getting loose in the shipping crate. This wouldn't have occurred if the tank had been packed in cardboard. However, Robert was very accommodating in having replacement stock shipped directly to me not only for these damaged items but also for a couple of sheets that were for a different version of this kit. When the kit was unpacked, there were nice wheels but no tires. A phone call revealed that the builder has a choice of tires or wheels that have been assembled with spokes. That option wasn't in any web docs about ordering the kit. I purchased tires but it would have been nice to know about this matter when the kit was ordered. What I consider a major safety issue is the aluminum firewall shipped with the kit. Aluminum has practically no fire resistance and this is a serious safety concern when the aluminum fuel tank is two inches behind the "firewall". At the very least, a sheet of galvanized steel should be shipped for a firewall--that is what I used to replace the aluminum sheet in my kit. This brings me to the primary premise of the kit. 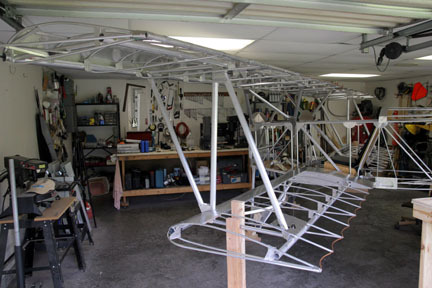 I had previous experience with aluminum tube and gusset construction with the construction of the Legal Eagle tail group. But building an entire airframe with this technique will be a new experience for most builders. The traditionalists will most likely not be impressed if their background is welded steel, riveted sheet aluminum, and/or wood. Concerns about pulled rivets working loose and fretting will be expressed. But the builder who approaches the project with an open mind will recognize how this technique yields a light, stiff structure in a relatively short time frame. Not having owned an aircraft with riveted tubing leaves me somewhat in the dark as to how it will fare long term. But light aircraft with this design have been in service for many years so I am prepared to see how this journey progresses. I found it more difficult to achieve preciseness with the tube/gusset construction when compared to the welded, wood and monocoque aircraft I have previously built. This probably isn't the best material for a builder obsessed with close tolerances and cabinet-quality joints. But what it lacks in preciseness it makes up with speed of assembly. Once the knack of drilling scores of holes into round stock is mastered, the build proceeds quickly. I am looking forward to the firewall forward and finishing phases of the build and expect the AA D.VII to be a nice flying light aircraft with tremendous ramp presence. The issues raised in this update are not insurmountable and probably not unusual in an economically priced kit. We make our choices...pay the kit vendor to do more of the work, or expend sweat equity and keep gas money in our pocket. The Airdrome Aeroplanes kit appears to be a good compromise. Please submit all questions and comments to the editor of this site.